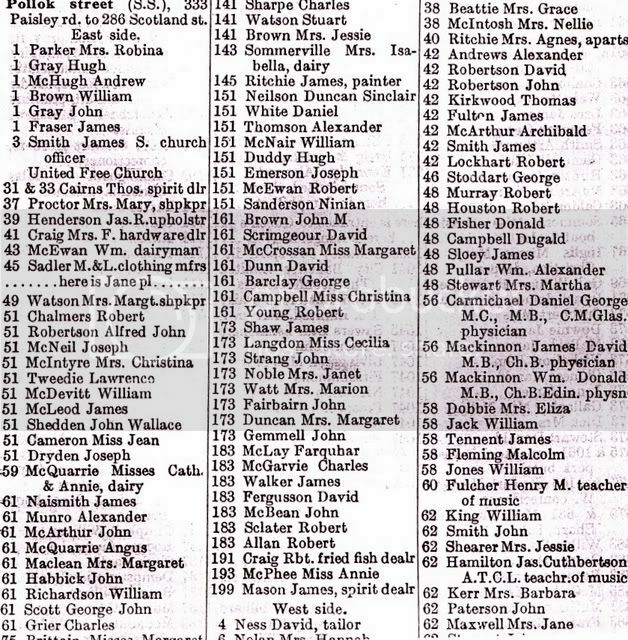 The Hidden Glasgow Forums • View topic - The Lost Gardens of Pollok St. 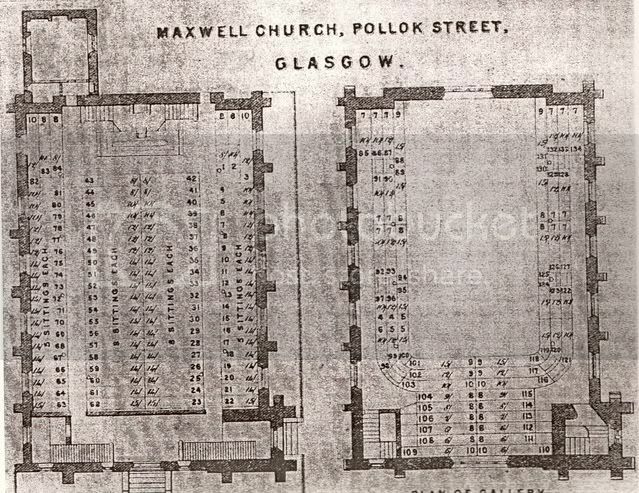 The Lost Gardens of Pollok St.
stood the Maxwell Parish Church, see below for further information on both. Scotland St. School lies at the bottom of the street. 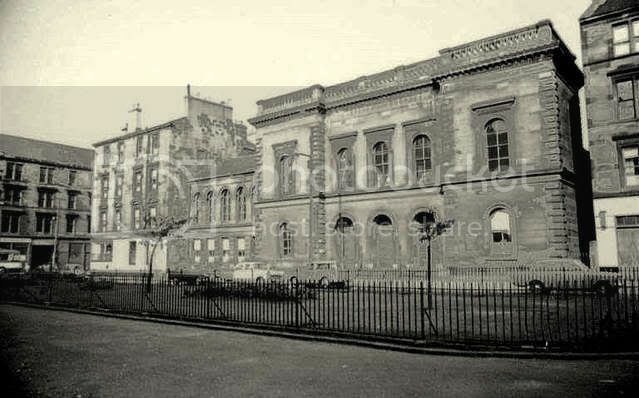 Pollok Street United Presbyterian Church on Pollok Street, off Paisley Road in Kinning Park, 1875. 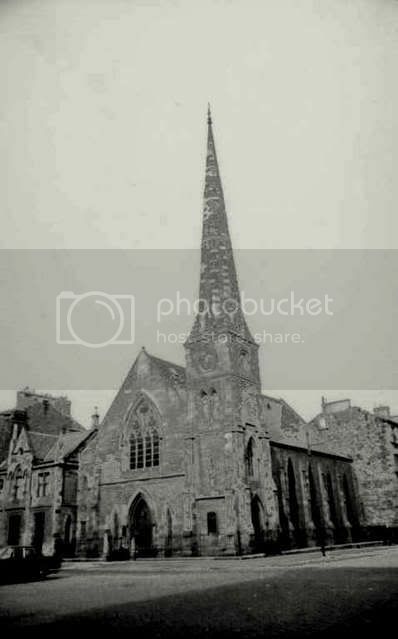 The church was dedicated in 1856 and in 1900 became Pollok Street United Free. 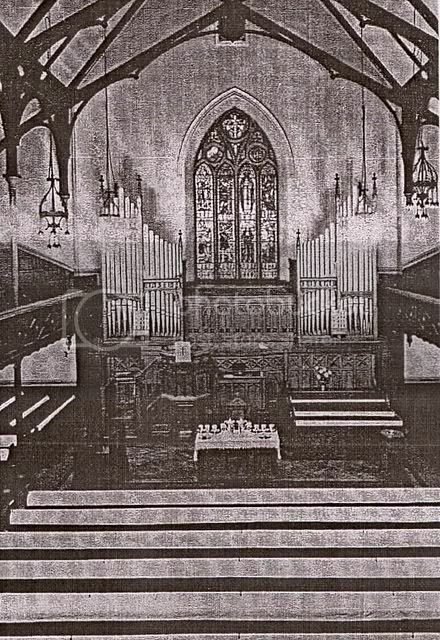 The congregation united with Plantation as Plantation St Andrew's Parish Church in 1975, and it subsequently became part of Kinning Park Parish. And the latest view from Google Earth, two pieces remain, one part just in front of Scotland St. School & the other running north from Houston St.
Hopefully some of you will have information to add, & some photo's of what now remains would be very welcome. Can anyone identify the large building on Paisley Rd. West that is facing onto Pollok St. in the aerial photo? A great and radical change has taken place in the appearance of Kingston district. Scattered and few were the habitations either for rich or poor. In summer the trees waved their green branches over the grassy sward, and in autumn fine apple and pear frees yielded good supplies of fruit. South from Paisley Road there stood apart two handsome self contained houses inhabited by Glasgow merchants, on the enclosed ground in front of which were sheepfolds. 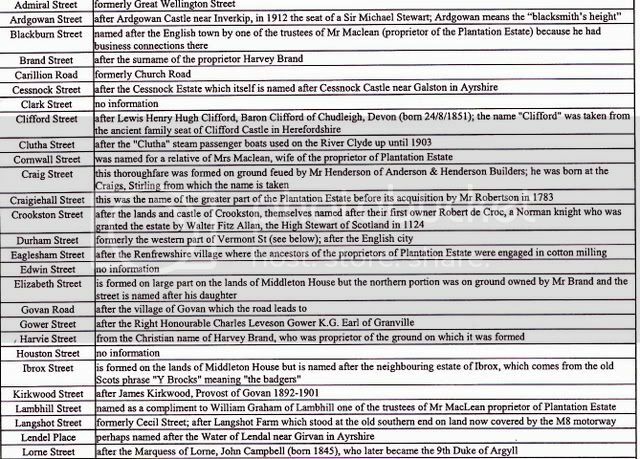 The late Bailie Pearson was the first to erect villas in Kingston, and succeeding in this enterprise others followed, and good substantial dwelling-houses were erected, and speedily let. In this way the district lost its rural appearance. Street after street was opened; the population greatly increased, and stores for the sale of various kinds of merchandise sprang up. In the western part of Kingston, fronting Paisley Road, nearly seventy years since, there was built Roseneath Cottage, which in external appearance was more Swiss-like than Scottish. This house was then considered a long way out of Glasgow, and many made it the end of their western walk. Its surroundings so pleasantly laid out made this old-time "tea"-garden very popular. The cottage is still in existence. Nearly opposite it on the roadside was a quaint-looking house, from the roof of which there rose up a spire-like tree. At the side of this habitation was Kinning House Burn, which in its meandering divided Lanarkshire and Renfrewshire, and poured its waters into the Clyde. At the west of Kingston stood the Windmill Croft, which was said to be the property of the Boyles of Kelburn, and to give the title of Earl of Glasgow to the head of that family. 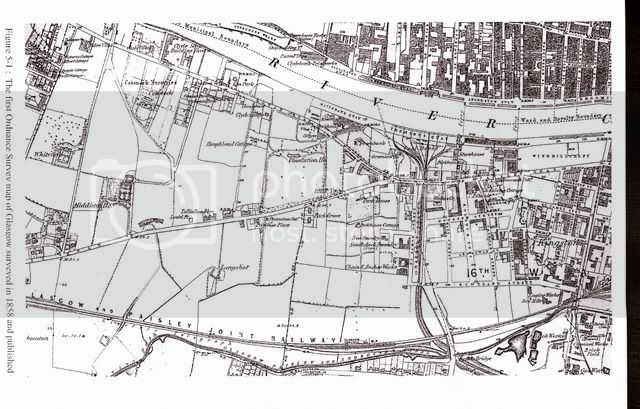 The ground was purchased by the Clyde Trust for £40,000, and formed into a tidal dock, with a water area of 5 1/3 acres, the quays extending to 830 lineal yards, which gives accommodation for 11,000 tons of shipping. The depth of water at full flow of spring tides is 21 to 23 feet, and at low water 10 to 12 feet. 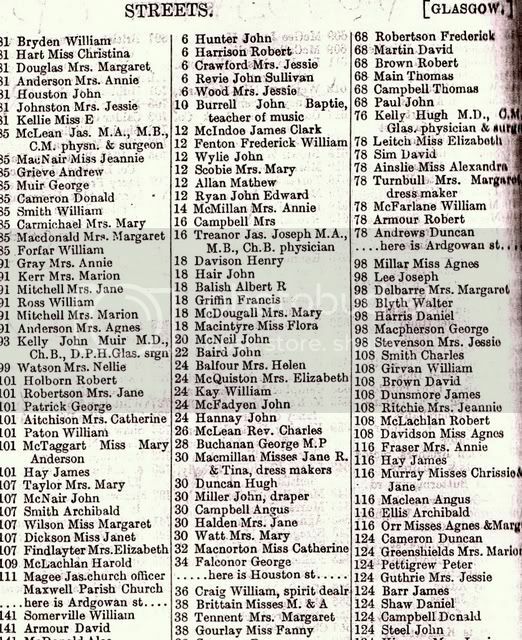 It was called Kingston Dock, was the first in Glasgow, and was opened on 10th October, 1867. The total cost was £155,000. The swing bridge to it is on the lattice girder principle. Its span is 82½ feet, and it has on each side two lines of roadway for passengers and carts respectively. The bridge cost upwards of £12,000. KINNING PARK. - This small suburb lies close to Kingston, and was constituted a burgh on 16th January, 1871. In my early days it was a truly beautiful rural spot, away from the smoke and stir of the city. The Kinninghouse Burn, formerly called the Mile Burn or Shiels Burn, was a sweet purling stream that meandered through arcadian groves down to the river. The opening of the Kingston Docks on 10th October, 1867, and the extension of the harbour brought trade and commerce to this place, and 1894 sees within its boundaries large engineering works, iron foundries, mills, and many other important industries. It is anticipated that in a few years this burgh will seek to form part of Greater Glasgow. West of the Kinning House Burn, however - that is west and south of Pollok Street - there were nothing but corn-fields and trees, except a few villas. 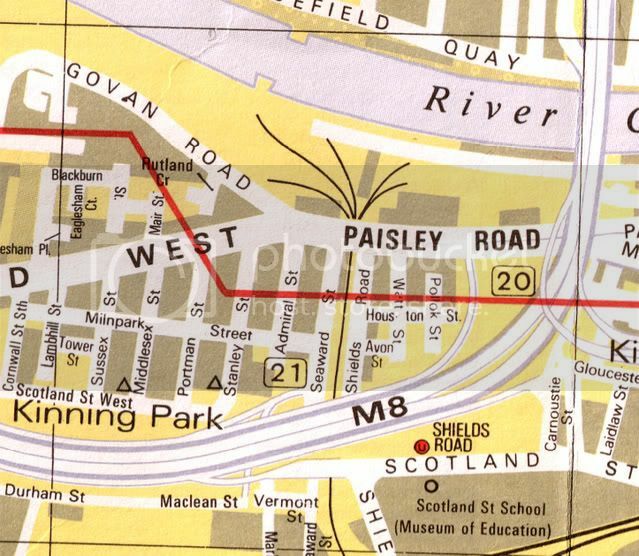 Some of the best coursing in the county was to be got where Pollokshields now stands, and indeed right down to the Paisley Road. 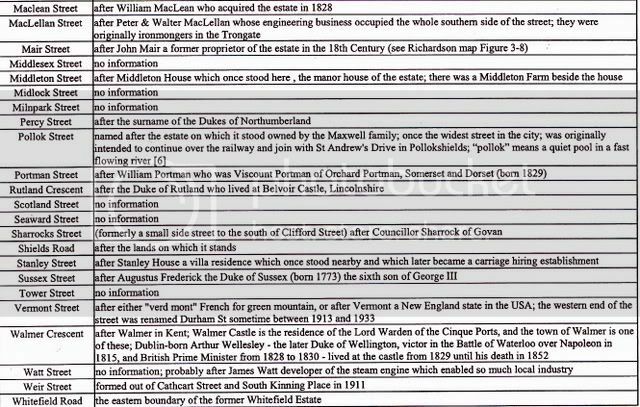 Fantastic wee bit of research there HH! Really brings it home just what was lost to the M8 here, not just the community and built environment, but the whole story of this areas development. Fascinating stuff! Great piece of work HH! The Google Earth image I think is somewhat out of date now, perhaps at least 2 old. The remnant of Pollok St. opposite Scotland St. School has gone - this is where the multi storey car park now is, next to Shields Road Subway Station. 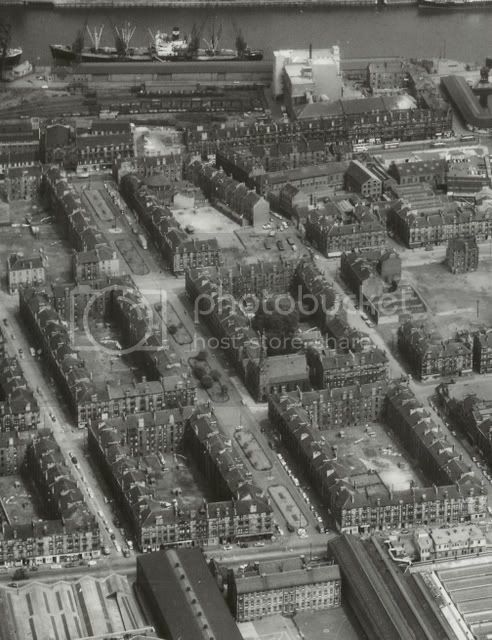 As for the large building on Paisley Road West facing onto Pollok St., as shown in the aerial photo, I think perhaps you are referring to the former Kingston Halls and Public Library, which is still there and has been used as a homeless persons shelter for many years. Great set of pictures HH! I remember this street very well. To me it always seemed misplaced between Scotland St. and the Paisley Rd.... like it really belonged in Mosspark or some other place that was a cut above the Kingston bailiwick. 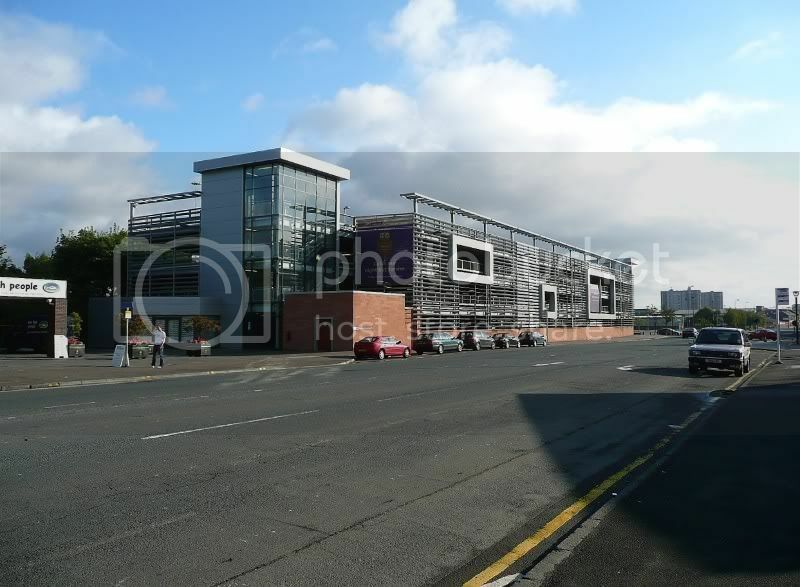 "Can anyone identify the large building on Paisley Rd. 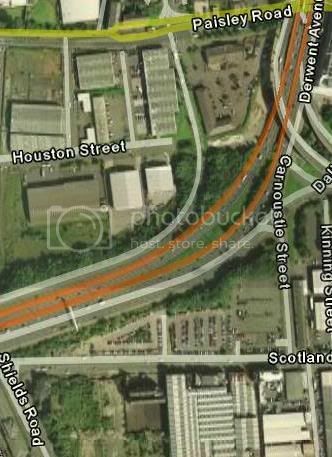 West that is facing onto Pollok St. in the aerial photo? " 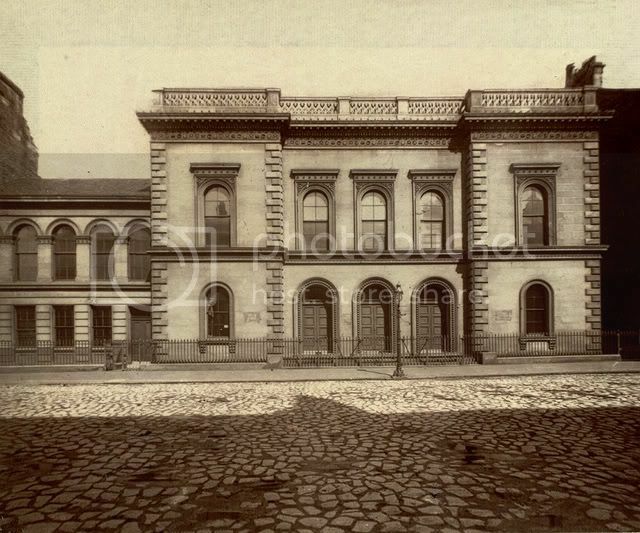 I agree with Viceroy that the large building facing Pollock St. is/was the Kingston Library. I'm about 80% sure it was a library but I'm 100% sure that in 1943 it housed soldiers. If I recall correctly, it was a fine looking building of red sandstone. Re: The Lost Gardens of Pollok St. This is actually what was left of Weir Street, Hollowhorn; Pollok Street is the next street to the west as you suggested. I think this is simply some sort of central reservation separating the Weir St. remnants from that on-ramp, which itself has gone, replaced by the exit at Harry Ramsdens. I studied this area a bit a year or so ago. Firstly though, that other photo isn't the remains of the gardens, you can tell from the relative position of the large building at the Clydeside. It's the remains of Weir St, you can still see the dog-leg at the end of the road. My mother's family came from this area. Some of it was abject poverty as Irish immigrants were crammed into narrow closes. 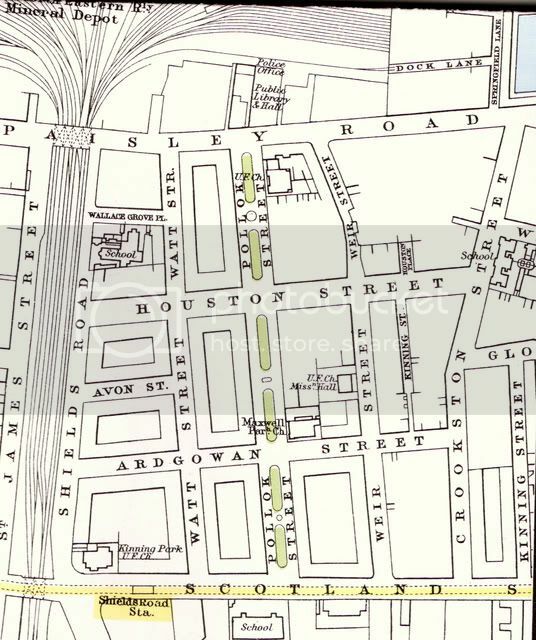 My mother's parents and her older siblings lived in Ardgowan Place which was renamed Kinning St and you'll see it on HH's map running between Ardgowan St and Houston St. Don't let the map fool you, this was the cramming in of Victorian slum housing in narrow lanes with little light. The houses were 'ticketed' meaning a metal plate was fixed to the wall specifying the maximum number of people allowed to live in the house. 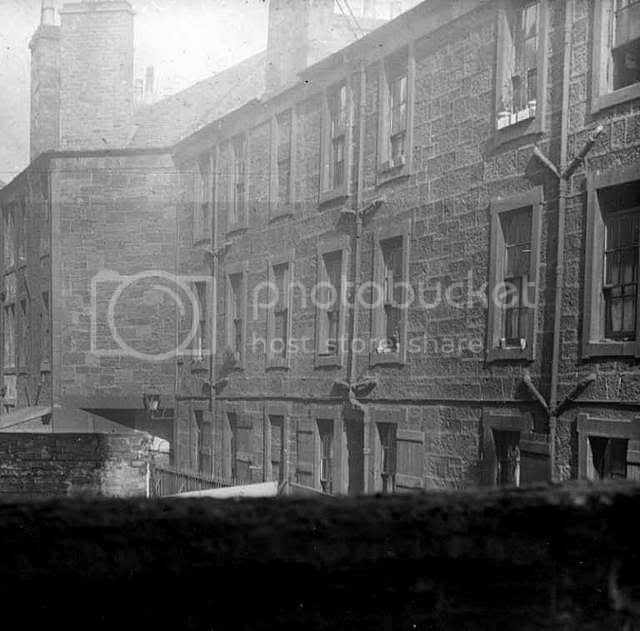 In this picture from HH, you can still make out the start of Ardgowan Place, a narrow lane between two tenements half way down the extreme right of the photo. The rest of the slums have been cleared except for a few tenements and you'll see the wash house with the low lined roof. As a teenage girl, my mother would visit her aunt still residing in Ardgowan Place. She still remembers walking by Pollok St which, to a wee lassie from Govanhill, seemed so posh with its gardens. She can still remember turning into that lane between the tenements. Here's what Ardgowan Place was like. My mother remembers climbing the stairs of that tenement in the picture. As you turned to go up another flight you were outside on a balcony. Those are toilet doors you can see on each outdoor landing. 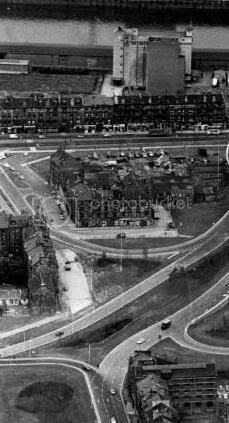 You'll see on HH's aerial photo, a lone tenement standing on the right of the photo just north of the entrance to Ardgowan Place. 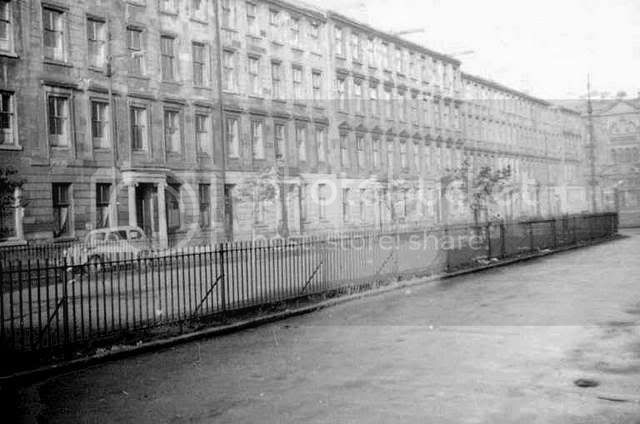 Well that bit of the road, Houston St, which runs in front of that tenement turns northwards just out of picture. That original bit of road is still visible in HH's google earth picture immediately behind Harry Ramsden's and the travel lodge. The next time you come off the motorway there glance right as you come round the bend and you'll see the original road among the waste ground behind the travel lodge. Better get down there quick as most of the streets just east of Scotland Street running north are all but closed off and large scale demolition underway at the moment. Must be preparatory works for the M74 extension and the Tradeston redevelopment. Excellent input, folks, just what I was hoping for, cheers. I had a good look at this area about 2 years ago along similar lines as Schiehallion, as my family originally came from Kingston and Kinning Park, and also the company i was working for at one time had an office next to the motorway. It was actually when someone on here posted the same map that HH was looking at. It might have been a thread about General Terminus Quay or similar. Anyway i don't think there is much left down there. Houston Street and Avon Street is all Industrial Units, some Streets have had Commercial Units which have been built, knocked down and new Units built again over the last 30 years. There were bits of Houston Street which still had the "white" smooth Asphalt on it from times past. Whatever happened with that old asphalt? Remember the stuff, very smooth and very durable. Or maybe it was just that there were not so many cars on the road. I did not look at Pollok Street at the time, but i think from memory it may be a stretch of the "white" asphalt that remains. I certainly remember the Cafe - Pollok Snacks from when i was a kid...now that was a chippy. 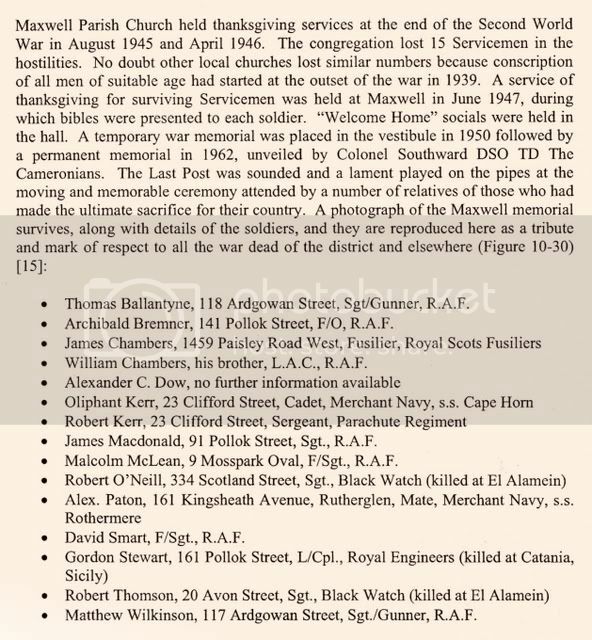 Everyone who had moved out the area for the Kingston Bridge, including my family would still head back there to meet up on a Saturday and Sunday. While we are in the neighbourhood, has anyone got a photo of Rutland Cresent before it was knocked down and rebuilt? 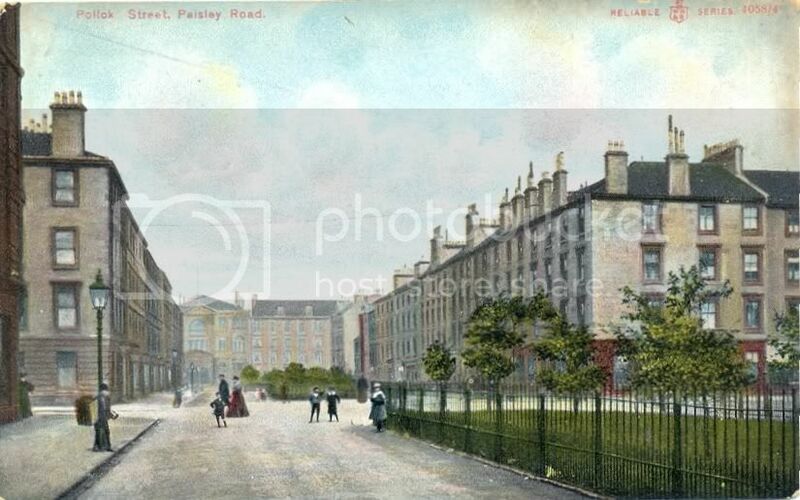 Looking down what was Pollok St. towards Paisley Road West and the old Kingston Halls & Public Library [the red sandstone building on the left]. This stretch of road is now called Houston Place. From the Scotland Street end - Pollok St. would have joined up with Scotland St. I reckon at a point about halfway along the multi-storey car park, just beyond the row of parked cars. 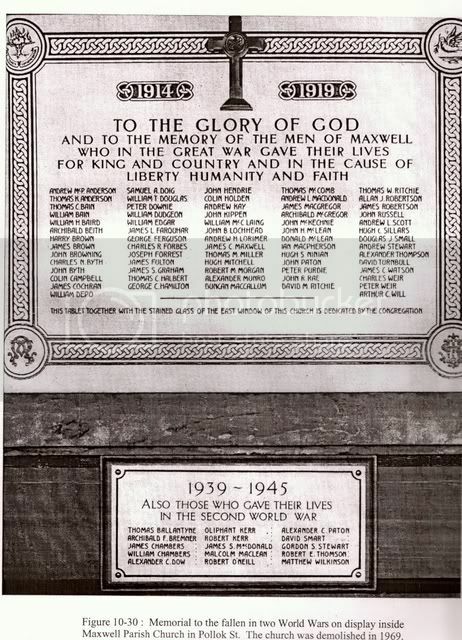 I can remeber the area very well as my dad had a shop at the corner of ardgowan and pollok Street during the 60's and when that corner got demolished to make way for the M8 he moved premises to watt street which was the next corner. I can clearly remeber the gardens in the middle of pollok st as i played football there with the local kids, someone else featured them gardens on here a while ago cant remeber which thread it was... brings back lots of memories. I remeber the italian chippy pollok snacks which served a great special supper across the rd from the kingston halls and pub with a sign featuring a jacobite waving a sword, can't remeber the name of the pub. oh and there used to be a railway line there somewhere i can remember sitting on an embankment watching the trains go by to and from the clyde at mavisbank quay. I struggle to see it and I can’t explain the bridge at the top of the street , most confusing. Looking back at the aerial photograph above though, it clearly shows each of the three sections had their own gardens. Great thread. I have an old postcard of Pollok St which makes a good "before" comparison (from ca 1907) for the photo by Viceroy in 2007. The postcard shows the Lost Gardens. Is McMahon's book in the Mitchell HH? Whether it is or isn't, I'd say it's a case of a mistake being compounded between VM and the book. 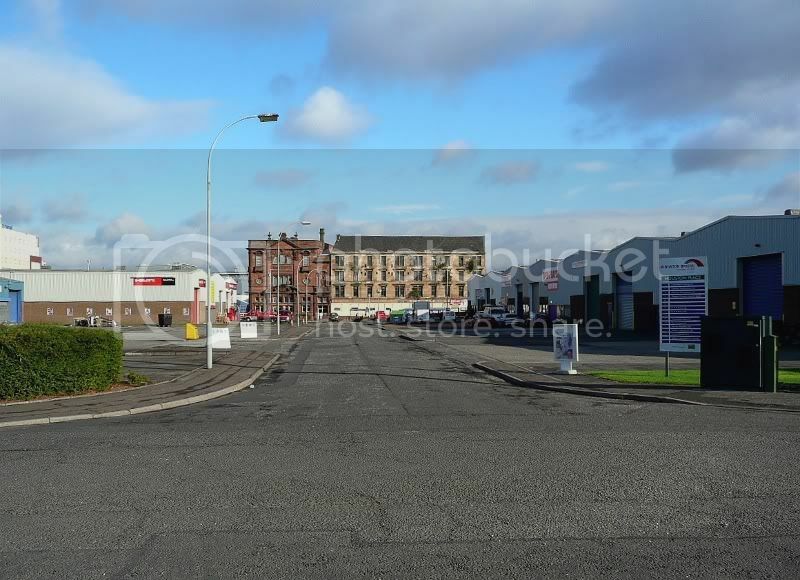 I'd say there is no way that is Pollok St in the photo. I reckon someone has got confused by the similar types of tenement with the portico-style entrances. I'd assume these are Alexander Thomson's. 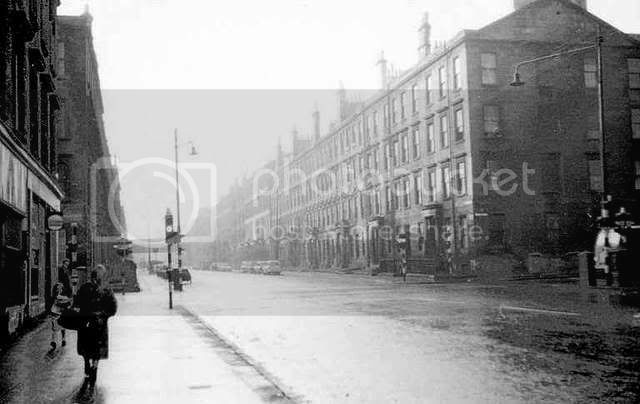 I cannot believe a residential street like Pollok St would've had traffic lights in those days. The volume of traffic wouldn't have justified it. It looks more like a stretch of Argyle St or somewhere like that. Yes, Schiehallion, it’s on a shelf in the Glasgow room, it’s a weighty tome. Brilliant photo, BH, I'm gobsmacked!